What is Loews Portofino Bay Hotel? Loews Portofino Bay Hotel is a high-end resort that's part of the Universal Orlando Resort theme park campus that includes: two theme parks, one nearby water park, two miniature golf courses, one shopping and dining complex, an off-Broadway style theater, and four hotels (other hotels include Cabana Bay Beach Resort, Loews Royal Pacific Resort and Hard Rock Hotel). Loews Portofino Bay Hotel is considered the most upscale of the collection of hotels and also the most remote from the parks (this can be a good thing if you're looking for a bit of distance from the over-stimulation of the parks). It is about a 15 minute walk from the theme parks and CityWalk, but there is also a ferry which runs several times an hour starting at 7am. We opted for the ferry rides since it was a nice way to start and end the day. What is Loews Portofino Bay Hotel like? 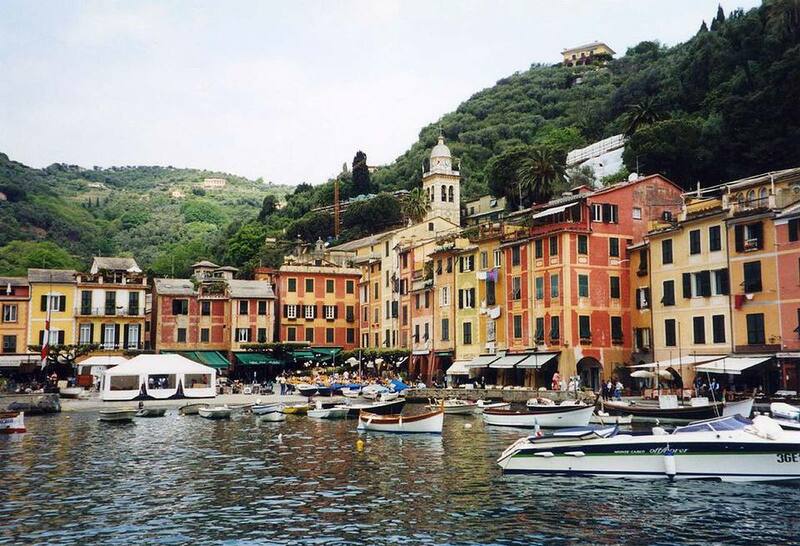 The resort is designed to resemble the actual port of Portofino in Italy. It has a man-made harbor at the center which also connects to the water route for the ferry. The building details are actually painted-on, giving the place a trompe l'oeil movie set look. Fountains, piazzas and Italian music add to the vibe. Overall, the resort manages the almost-miraculous feat of being both family-friendly and maintaining a romantic, sophisticated atmosphere for adults. Guests can wander most of the spaces and enjoy the detail that has gone into creating a hotel that has a layout more like a village than a hotel. You will find an indoor village street, a bocce ball court, arcade, and many places to just sit and enjoy the atmosphere. In the evenings all along the harbor front will be serenaded by an opera singer, it is surprisingly calming. The quiet, refined atmosphere that was a pleasant antidote to a day at the parks. Early entry to an often crowd-free park and Harry Potter attractions (the park opens officially at 9am, but as a hotel guest you will be able to walk in at 8am and get access to Diagon Alley). Free Universal Express Pass Unlimited for the duration of your stay (more on that later). The pleasant ferry ride to the park. Park-wide perks like priority seating at select Universal Orlando restaurants, free package delivery to your hotel room, and resort-wide charging privileges. Club Level rooms with access to the Club Level Lounge offering complimentary breakfast, beverages and daily snacks. Guests can personalize their room keys to show their favorite Universal characters (like Spider-Man or The Simpsons). It's a nice, free souvenir. If you are staying only one night, you can get the pass at your hotel for your check-in and check-out days, that is two days of use for a one night stay. This pass is picked up at the hotel from an automated kiosk that prints a pass with your photo. The pass will allow you to bypass the main line for most attractions (not included is Harry Potter: Forbidden Journey, Hogwarts Express & Escape from Gringotts). During busy seasons this pass will save you considerable time and enhance your visit. Even during slow seasons there are some attractions such as Minion Mayhem which always have a line that you will mostly be saved from waiting on. Portofino Bay has 700 rooms, 50 suites, and the largest standard guestrooms of the three Loews hotels at Universal, which start at 450 square feet. Portofino Bay's standard rooms are nicely laid out with spacious bathrooms, upscale linens and a soothing color palette of grey, blue and white. Views consist of nicely landscaped areas, beach pool view, or harbor view. After a long day at the parks it was a pleasure to come back to this relaxing setting that was free of visual stimulation and a nice respite from the mayhem of the parks. If you want to limit walking to the ferry, request a room in the West Wing. Want a view of the feature pool? Request the Villa Guest Rooms. Want a room that is nearby the lobby and restaurants? Rooms closest to the lobby building in the East Wing are for you. Extras in the room include an iron, safe big enough for two iPads, two robes, hotel stationary, for a fee mini-bar, Keurig coffee maker and the usual pay per view tv options. If you upgrade to a Club Level accommodations you get a 490 square feet room with either a Garden or Bay View. Loews Portofino Bay has three luxurious pools for guests. The main pool at Portofino, the Beach Pool, is a free form pool with a water slide, lifeguards, zero entry, handicapped accessible chair system and surrounded by cushioned beach chairs on sand. If your idea of happiness is a lively beach with music and easy access to drinks, food, a hot tub with waterfall, a pool table and more, then this is the spot for you. The Villa Pool is a short walk away and is heaven for those wanting quiet water time. There is bar service from pool attendants and is a good spot if a basic hotel pool and silence is what you are after. The pool selection at Portofino Bay surpasses many hotels in size and quality. A third, hillside pool, is an oval pool tucked away at the edge of the property and surrounded by lush foliage. A family could easily get from park to pool in a matter of 30 minutes for a highly recommended break. The Beach and Villa Pools offer free fruit infused water and towels. All of the restaurants at the hotel feature Italian menus. For other cuisine, CityWalk is your go to spot. We dined at Mama Della’s, a full-service restaurant that serves traditional Italian dinners in a casual but classy set of rooms designed to feel like the home of an Italian matriarch. Old World specialties like Insalata Caprese, Pollo Marsala, Lasagna and Frutti di Mare are paired with an extensive wine list. Service was prompt and efficient, with the waiter quickly bringing out the kids meals knowing that the little ones would get antsy waiting for the rest of the entrees to come out. Our kids loved the roving band of Italian singers that visited each table and serenaded guests with opera arias. Beyond pools and dining there are plenty of great amenities at Loews Portofino Bay. Fitness center: Great gym with an extensive range of modern equipment (treadmills, bikes, stair climbers, free weights, and weight machines); plus, access to the spa's sauna and steam room. The business center (open 24 hours) is staffed by an attendant Monday through Saturday to help with faxes, copies, overnight packages, and computer rentals. The game room has about a dozen coin-operated machines (open 24 hours). Shops selling resort apparel, paintings, and convenience items are located around the piazza. Harbor Nights is a monthly event where guests gather under the twinkling lights of the hotel's Harbor Piazza for a night of wonderful wines, gourmet food samples, complimentary hand-rolled cigars and live jazz concerts in Orlando. Harbor Nights takes place four to five times per year.